Ride the Cab of this Machine!! 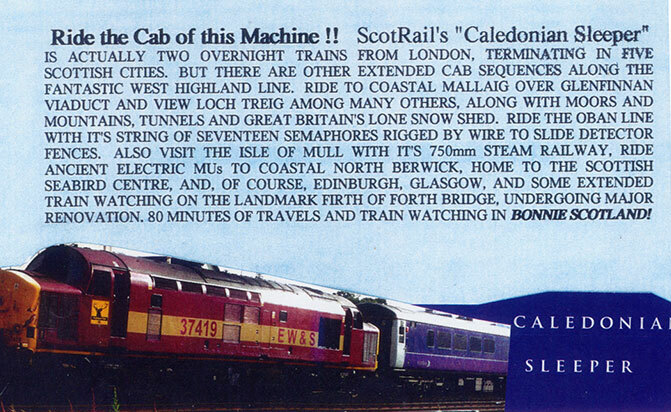 ScotRail's "Caledonian Sleeper� IS ACTUALLY TWO OVERNIGHT TRAINS FROM LONDON, TERMINATING IN FIVE SCOTTISH CITIES. BUT THERE ARE OTHER EXTENDED CAB SEQUENCES ALONG THE FANTASTIC WEST HIGHLAND LINE. RIDE TO COASTAL MALLAIG OVER GLENFINNAN VIADUCT AND VIEW LOCH TREIG AMONG MANY OTHERS, ALONG WITH MOORS AND MOUNTAINS, TUNNELS AND GREAT BRITAIN'S LONE SNOW SHED. RIDE THE OBAN LINE WITH IT�S STRING OF SEVENTEEN SEMAPHORES RIGGED BY WIRE TO SLIDE DETECTOR FENCES. ALSO VISIT THE ISLE OF MULL WITH ITS 750mm STEAM RAILWAY, RIDE ANCIENT ELECTRIC MUs TO COASTAL NORTH BERWICK. HOME TO THE SCOTTISH SEABIRD CENTRE, AND, OF COURSE, EDINBURGH, GLASGOW, AND SOME EXTENDED TRAIN WATCHING ON THE LANDMARK FIRTH OF FORTH BRIDGE. UNDERGOING MAJOR RENOVATION. 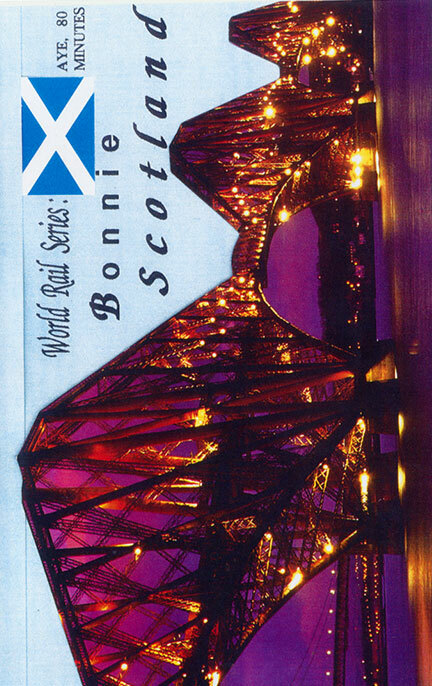 80 MINUTES OF TRAVELS AND TRAIN WATCHING IN BONNIE SCOTLAND!